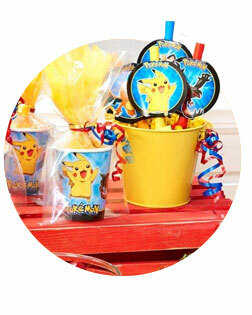 If your child and his guests gotta catch 'em all, then get items from the Pokemon Party Supplies collection! You can get everything you need for a Pokemon party, like dinner plates, cups, napkins, balloons, key chains, pencils, favor containers, wall decorations, table covers, balloon bouquets, personalized stickers, and plenty more – all featuring Pikachu, Ash, and their Pokemon friends! Send Your Child on a Pokémon Adventure! Is your child destined to become a great Pokémon master like Ash Ketchum? If your son or daughter loves Pikachu, Squirtle, Charmander and the rest of the characters from the Pokémon universe, choosing a Pokémon theme for his or her next birthday party is the only way to go. With help from Birthday Express, you can throw a Pokémon-themed party that your child will remember forever. From custom-designed balloons and party favors to Pokémon-themed tableware and games, Birthday Express has all the supplies you’ll need for a flawless Pokémon birthday party. Start thinking about party food early. Look for creative ideas online about how to incorporate your theme into the main course, dessert and snacks. Pinterest and party-planning blogs are full of themed party ideas and recipes for you to try out. Planning a successful birthday party for your child can be a little overwhelming. But you don’t have to do it alone. Find expert tips and tricks on the Birthday Express Ideas Blog covering every step of the party-planning process. You’ll find ideas on decorations, food, activities and more. The Pokémon Invitation Postcards are a great way to let guests know about your child’s upcoming Pokémon-themed birthday party. Each postcard features Pikachu and Meowth inviting guests to save the date and come celebrate. When these spectacular invites arrive in the mailbox, your guests will be counting down the days until the big event. You’ve picked a theme, and now it’s time to incorporate that theme into your party. One of the easiest ways to let your Pokémon theme shine throughout your party is with decorations. Birthday Express has a wide selection of Pokémon party supplies available so you don’t have to settle for plain balloons, streamers and confetti. You can fill the party with custom balloons, hanging swirls and banners, all featuring Pikachu, Charmazard and more Pokémon favorites. With these special decorations from Birthday Express, party guests will feel like they’ve been transported into their very own Pokemon adventure. Every great birthday party has a killer collection of balloons. Instead of settling for plain, run-of-the-mill balloons, use the Pokémon Balloon Bouquet to take your party to the next level. The bouquet is a perfect match for your theme and will excellently accent the rest of your party décor. The Pokémon Plastic Tablecover is a great way to add fun decorations to the party and to keep your table clean when it’s time for food. The sides of the tablecloth feature everyone’s favorite Pokémon friends, while the top is white to easily match your table décor. The table is another great location to bring your Pokémon theme to life. Even the small details count when it comes to throwing a flawless party, which is why Birthday Express has all of the supplies you need for an amazing Pokémon-inspired table placement. Set the foundation with a themed tablecover and then top it with custom-designed dinner plates, dessert plates, napkins, cups and silverware. Top off your beautiful table arrangement with the Pokémon Table Decorating Kit, which includes a large Charazard centerpiece, two smaller Pikachu and Meowth centerpieces and confetti. One of the most difficult aspects of planning the perfect party is the activities. It’s not an easy task keeping kids busy and engaged the whole time. Luckily, Birthday Express understands and has an assortment of Pokémon-inspired activities available to help you keep your party guests entertained. If you need more than the classic party piñata, Pokémon tattoos and stickers available from Birthday Express, you can always break out the Pokemon cards or play a few Pokémon episodes as a simple way to pass the time and keep the kids busy. This party classic has been entertaining kids for ages, and it’s an easy way to get your child and party guests active. The Pokémon Giant Piñata is sure to excite everyone with its incredible size. Measuring at 10 3/4 x 10 3/4 x 11, the piñata can hold up to 10 pounds of candy! Kids love games, and this custom Pokémon Party Game will definitely be a hit at your child’s party. The Pokémon Party Game kit includes a sheet of a poster of Pikachu and other Pokemon, a blindfold, and eight Pokeballs to help pin the ball on Pikachu. 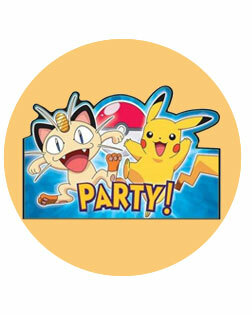 Your child’s Pokémon party will be one that guests want to remember. Party favors are the perfect way to let guests bring a piece of the party home with them and continue the fun long after the party ends. Party favors are also an easy way to thank guests for attending your child’s party and making it a day worth remembering. If you need ideas for putting together spectacular party favors, don’t worry. Birthday Express has Pokémon-themed party boxes filled with sweet treats, bracelets and toys to help you make the best party favors your party guests have ever seen. The Pokémon Filled Party Favor Box is the perfect way to prepare party guests for their own Pokémon quest once they get home. 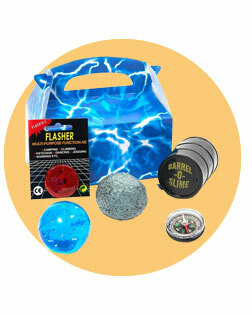 The favor box includes a compass, glitter bouncy ball, a small barrel of slime, flashing safety light, splat rock and a blue lightning box to put everything in. 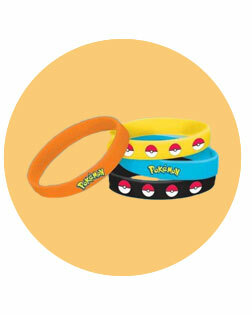 With the Pokémon Rubber Bracelets, party guests can remember your child’s amazing Pokémon party wherever they go. You can either add a bracelet to goodie bags for kids to take home or hand bracelets out as prizes throughout the party.